Cloth price is for 'double width' cloth (roughly 59" wide), priced per yard. The material is the "non wool" tartan fabric that we've seen. 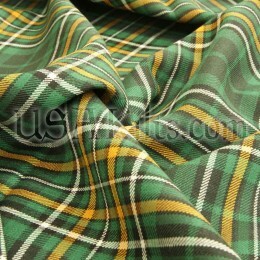 It's the same cloth we use to make our Casual and Semi Traditional kilts and it's woven in the UK. This material is great for shawls, scarves, pillows, great kilts, etc. It's a great alternative for those with wool allergies, it's machine washable and it's coated with Teflon to reduce stains! Typically, it ships within 48 hours as the cloth is stocked in our shop.